Charging kit in unique packaging is perfect for holiday gifts or employee rewards or just customer thank you gifts. This Charge Up Kit all in one set comes with it's own power bank (with a 6 hour charge), car charger and fringed bag that double as a screen cleaner. It is compact enough that it can carried in a bag or stowed anywhere. Available in bright fun colors, you can customize it with your logo or design and use it as a excutive gift or for resale. It is sure to be a must have and wanted item by all your customers. Need something added or questions? Call 888-332-ADCO! 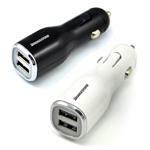 Includes USB Car Charger and Power Bank. Frizzy bag for cleaning tech items is lined. Power Bank will charge device for up to 6 hours and take 4-5 hours to fully chrge. Input 12-24V DC; Output 5.0V + 1000 mAh.Output DC 5V-500mAh/Input 5V-500mAh. Capacity 2200mAh. Contains an intelligent IC chip for full protection of overcharging, over discharging, overloading, short circuit, and high temperature protection. RoHS, FCC, CE and UN38.3 certified. Order must specify a color for each of the three components.